In which I introduce you to a very special place! Once upon a time, in a land far, far away … My story of this resort in Northern Wisconsin could start out that way. It feels like a fairy tale. It is certainly a fairy tale place made wonderful by childhood memories and summer traditions reclaimed. I started coming here with my parents when I was a little girl, as did my father with his parents, when he was a little boy. It’s that kind of place. Today, as we sit in the communal dining room (only slightly remodeled and the menu slightly updated) you look around at tables set for 15, 16 even 20 people! Grandparents, sons and daughters, parents, aunts and uncles, nieces, nephews, even great-grandchildren are all here together and you realize that the tradition of a week at the resort is as strong now as it was forty years ago when I was one of those grandchildren. Up until the age of 7, this vacation meant a week in the woods, making crafts (Especially lanyards! Remember those?) with the children’s coordinator. I don’t know what my mom and dad were doing while we were playing – probably fishing – since that’s what lies beneath the premise for the place. After I started going to summer camp (Camp Osoha, which was less than 15 minutes from here), staying here was one more week in paradise before we had to go back to “civilization” – and school. 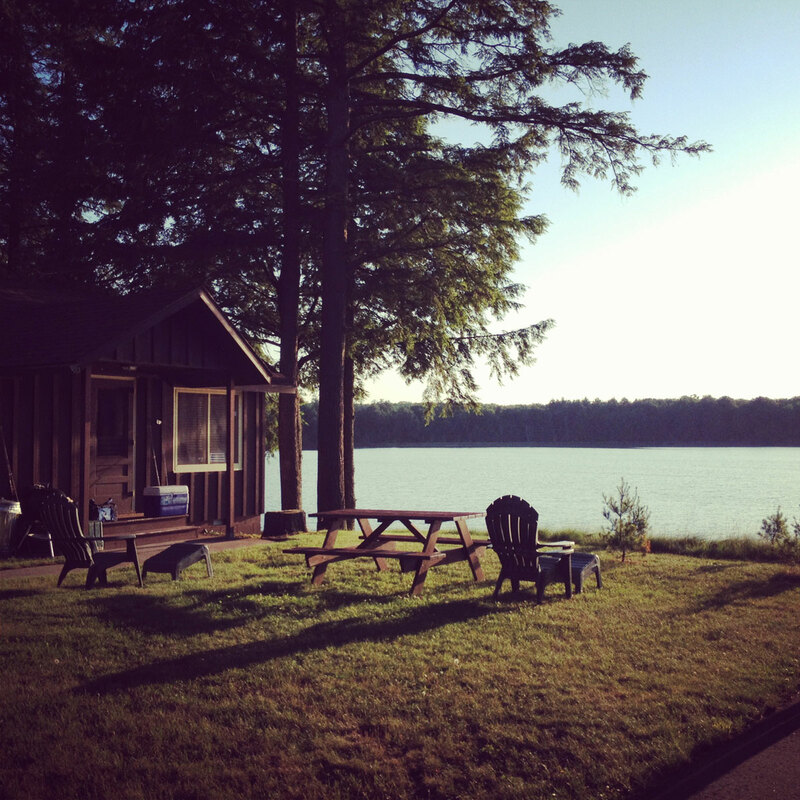 Back to the cabin resort…this one has 7 major lakes on its property. On two of the lakes, Big Crooked (called Home Lake by members) and on Wolf Lake (called Wolf Lake by members) there are lodges with dining rooms and other common spaces, as well as a series of cabins strung along the lakeside. When I was a child, the cabins just had bedrooms and living rooms, and maybe a screened porch. Today, most also have kitchens, because the resort is now also open in the winter (but the dining rooms are not). I posted this on Facebook. This is the cabin next door to ours, but it is very similar. See the lake? That’s Wolf Lake. Home Lake is the place for families with little kids. It has a beautiful sandy beach, lots of boats (sailboats, canoes, paddle boats) a big playground, and tennis courts. Wolf Lake is more a place for adults who like to fish. When our kids were little we stayed at Home Lake, but now that Gerry and I are often here alone, we like to stay at Wolf Lake, where it is quieter. We used to have a tennis court here too – but this year it is gone. Each cabin has the use of a fishing boat for the week. Whether you fish or not, “the boat ride” is an important part of a Wisconsin summer day. The resort also maintains fishing boats on the other five lakes on its property, and many a half day we spend fishing on those out-laying lakes. Some of the lakes are specialized for certain fish, and having long ago given up any hope of casually catching a walleye, Oscar and I like to go straight to the bass lakes and have some real fun. Even at times when the fishing is slow, we are invariably accompanied by loons, and often eagles, too. All of these lakes are hidden in acres and acres of forest. When I saw the Black Forest in Germany I thought the name so fitting: As you looked into the trees, the forest appeared black because of the density of the trees. Here, it is much the same. Strange to think that at the turn of the previous century, this entire area had been logged, and I mean logged to barrenness, and now the forest is so thick that selective logging has begun again. The forest is heavily crisscrossed by trails – for hiking in the summer; for snowmobiling, cross country skiing and snowshoeing in the winter. Hiking the trails with my camera is my favorite activity of late – and this trip has been no exception. This trip (and now I am referring to June 17-21, 2012) has been marked by rain and storms. True to form, Wisconsin weather has not turned me into a liar – we have had the span of at least three seasons in a single trip. That is what makes packing so difficult! Even in June, you have to be prepared for everything short of snow. 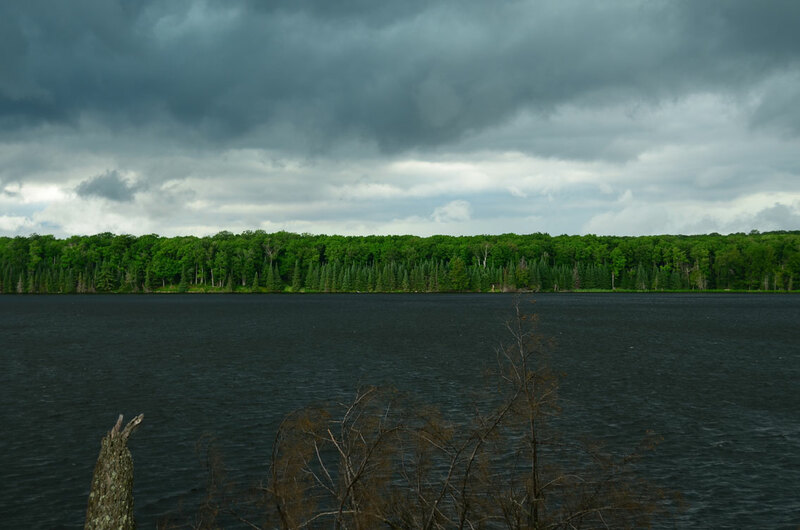 View of Wolf Lake from our cabin, just before the storm started. Once it did, we couldn’t see a thing. Last night, the deluge was so intense (this is the same deluge that drowned all those animals at the Duluth Zoo), we couldn’t see the lake even though it is less than 20 feet in front of our cabin. This morning the temperature had dropped to the low 60s, but at least there was intermittent sun. We are here on this trip to catch a glimpse (yes, we are reduced to that!) of our sons. The epitome of dedicated camp counselors, they have racked up an impressive number of years both as campers and as counselors. I think we are finally getting to the point where the camp has paid them to work there almost as much as we paid for them to attend. Gerry, our 25 year old, has 17 years at Red Arrow, and Oscar, our 22 year old, has a decent 15! Even though it is hard for those of us who love the “Northwoods” to believe, camp counselors actually get paid to play with kids who are canoeing, horseback riding, tripping, sailing, swimming, water skiing, trap shooting, song-festing, cook-outing, etc., etc., etc. for 7 weeks (yes, I made up those verbs…). So catch a glimpse is all we did: Monday night they had an “early night” – i.e. off work early before the bonfire with the counselors from all the nearby girls’ camps – so we got to take them out for dinner and get caught up on all the people associated with camp who we know, and yes, legitimately, love! We celebrated Father’s Day, a day late. But I think Gerry Sr. might agree that a great Father’s Day present is seeing your children so involved in something they love. We’ll be back up here in mid-July. Watch for future posts about our beloved Up North and please, share your stories, too! [I reread this post today, April 18th, 2016 and thought I might update a couple of things: Neither of my sons is still a camp counselor. I think even Peter Pan had to eventually grow up. The camp is still going strong: Red Arrow Camp in Woodruff, WI . I cannot recommend it highly enough. For boys ages 8-16, for a single 7-week session. Camp Osoha alas, my alma mater and an unofficial sister camp, no longer operates. Nowadays, sisters of Red Arrow boys attend Clearwater Camp, Red Pine Camp and Camp Nicolet , all excellent. I am a real believer that summer camp gives children a safe and healthy way to grow, unfettered by parental expectations and interference. It is a source of life-long friendships and shared experiences that allows children to grow in self-confidence and tolerance. My paradise remains the same. As our summer focus has moved away from the Northwoods along with our sons’, spending a week up here is not the given it was for a couple of decades. Still, we hope to get there as many years as we can and we’ll look forward to our grandchildren joining us there for fishing! My wife and I are interested in joining Dairymens. Please provide us with a membership application and fee schedule. I have great memories of feeding the tiny chipmunks peanuts and the albino deer bread, catching bass and playing cards. We went with my dad’s good friend Gene Bradfish and his family. Good times! Thank for posting this! I too grew up going the Dairymen’s. We had the same cabin every summer. I befriended the deer who often roamed onto the tennis courts. And bingo night was a blast too!